Breakfast and WIFI are included in all rates at the ibis Styles de Meaux Centre hotel. Located in the heart of the historic center of Meaux, our hotel is perfect for a leisurely weekend. Close to Meaux Cathedral, 5 minutes from the World War museum and 15 minutes from Disneyland Paris. 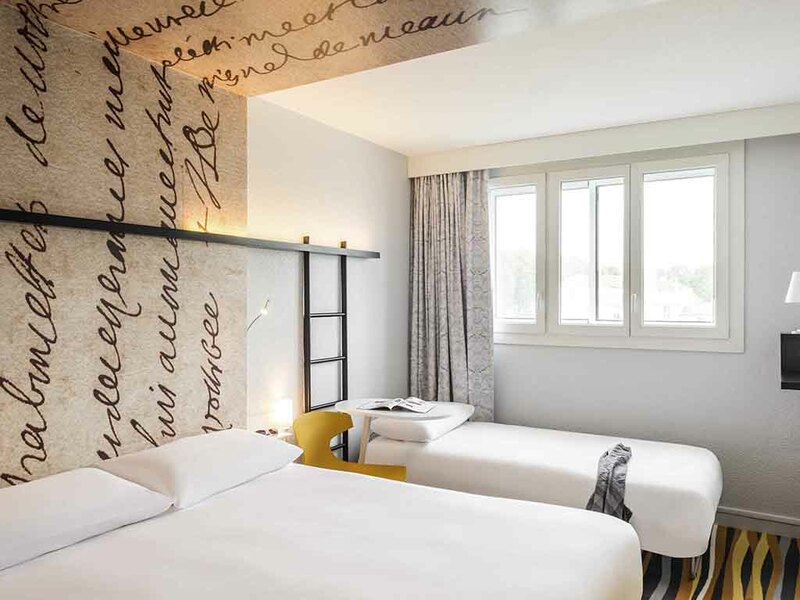 Enjoy the peaceful surroundings and facilities for a day of business in complete serenity, and on a practical note, the hotel is close to Meaux train station. Meaux is a small town, steeped in history, located on the outskirts of Paris and crossed by the Marne River and the Canal de L'Ourcq. It is also just 15 minutes from Disneyland Paris. Warm, welcoming and modern, with a comfortable bed and a practical bathroom, our rooms offer everything you need for an enjoyable stay. The rooms are equipped to ensure your comfort thanks to the Sweet Bed by ibis bedding and a mobile table so that you can work wherever you like. Bar with view over the Marne, with a musical atmosphere, brunch on Sunday mornings and a tea room in the afternoons.